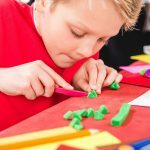 This recipe makes awesome sand castles and works well for molded shapes. Pour 1 1/2 cups of water into a plastic bowl. Slowly pour the cornstarch into the water, stirring thoroughly to remove any lumps. Pour in the sand, mixing well so that all the ingredients are combined completely. Keep stirring! If you purchase colored play sand, you can skip this step. Add a few drops of food coloring or a few tablespoons of powdered tempera paint to the mix. You can separate the sand evenly into smaller containers and then add different colors separately if you wish. Add glitter if you want to. When you use flour and baby oil, you get a light, clean-looking product. However, it does look a little less like sand. 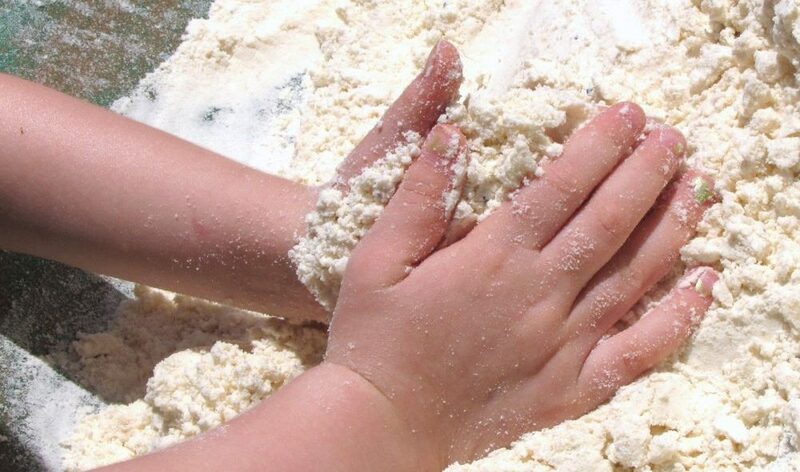 Measure your flour into a large plastic bowl. Add the baby oil and mix well with hands or a large wooden spoon. You can have your children mix it with their hands if you do not mind a bit of a mess. If you want to color your sand, divide the flour up evenly into smaller bowls. 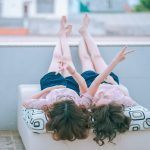 For coloring, you can use a tablespoon or two of powdered tempera paint, a few drops of food coloring, colored powdered drink mix, such as Kool-Aid, or even a few tablespoons of powdered chalk. Mix each container thoroughly. The main advantage to this recipe is that these two ingredients make Moon Sand that looks like snow. Mix the vegetable oil and cornstarch in a large plastic bowl. If the mixture seems a little on the dry side, add a tablespoon or two of vegetable oil one at a time to loosen it up. If you want some of your Moon Sand to look like snow and some not to, you can divide the Moon Sand into two or more small containers. Add a couple tablespoons of powdered tempera paint, or some food coloring. Package your Moon Sand in re-sealable, airtight containers and store in a cool, dry place. It should be usable for two to three months. You can revive your homemade moon sand with 2-3 tablespoons of water. All three Moon Sand recipes look great colored and with glitter added. Using a few sprinkles will give it that a bit of a shine, whereas a half cup will really get it glittering. For scent, use any type of extract. If you pour the Moon Sand into a large container with sides, such as an old roasting pan or a large casserole dish, you can contain some of the mess. Avoid scents with very young children. Also, teach children not to put Moon Sand anywhere near their face, as it can be a nasal and eye irritant. Some people report that the baby and vegetable oils leave a residue on surfaces. Have your children invent fun stories as they play. Of science – combining ingredients to create new materials; mixing colors. Of math – measuring ingredients and counting out cupsful. Have your children use cookie cutters to make shapes. 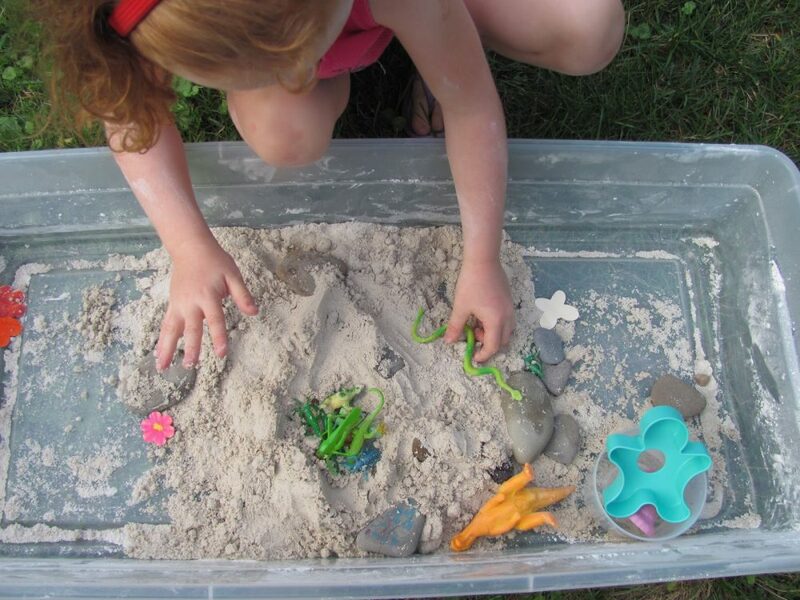 Make playscapes with Moon Sand – a farm, construction site, the surface of the moon. Add small cars, people, animals, small rocks, etc. Build a volcano with Moon Sand. Get ready! Frothy lava will pour up and out of the volcano. Recharge the volcano by putting in some more bi-carb and vinegar for explosion after explosion after explosion. 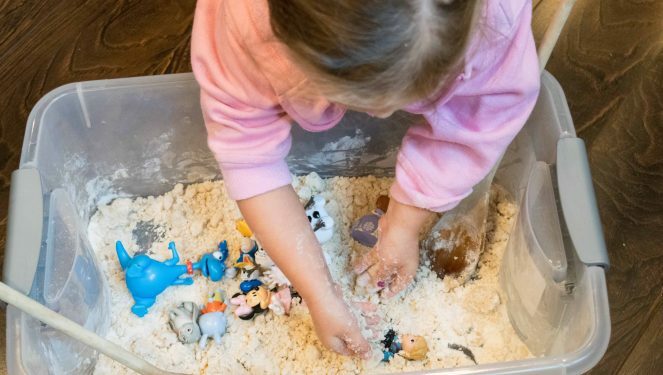 Moon Sand is very cheap and easy to make, and the kids will love playing with it. 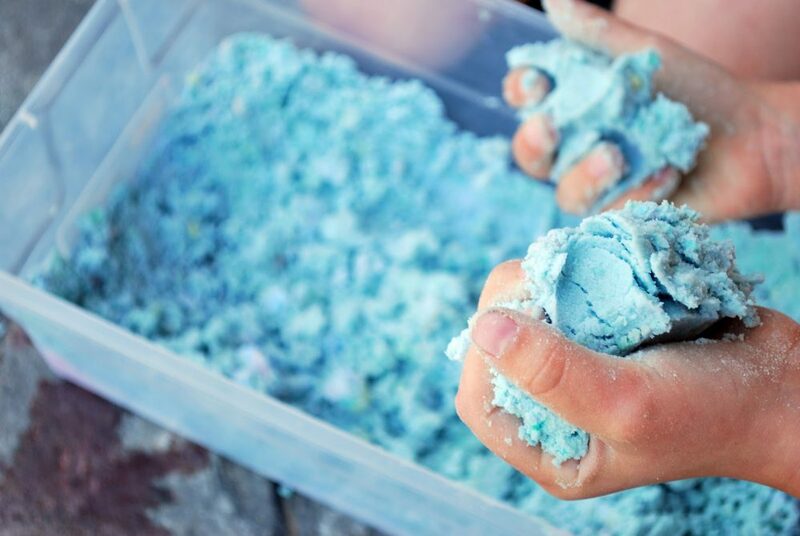 Our homemade Moon Sand recipes provide a sensory play experience for your kids. 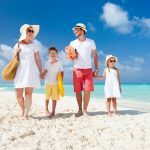 With just a few simple ingredients, children can form, mold, make shapes, and build the best sand castles ever!